HCM City Party Secretary Dinh La Thang has urged local authorities to consider implementing a social housing policy that has helped attract more investors in Binh Duong Province. 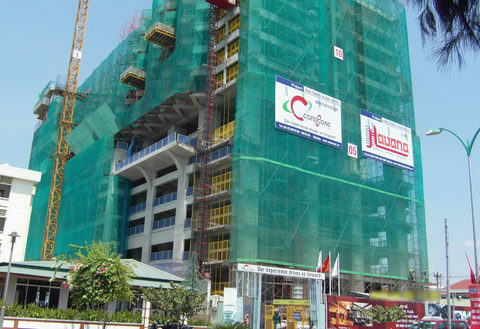 Thang said that HCM City wanted to provide more housing to lower-income workers, but that implementation had been difficult as investors were often reluctant to pour money into such projects. Thang asked Binh Duong Province’s authorities during a recent meeting in the province to help HCM City officials develop a better social housing policy. He said that administrative procedures on such buildings, which usually contain apartments of 25-35 square metres, could be as streamlined as those used for commercial housing. Tran Thanh Liem, vice chairman of Binh Duong’s People’s Committee, said that 25 out of 43 social housing projects in the province had been completed and put into use, with a total area of 491,000 sq .m and an average price of VND4 million (US$177.8) per sq metre. The Investment and Industrial Development Corporation (Becamex IDC) is the main investor of social housing projects in the province, which has 2 million people, 52 per cent of whom are migrants from other provinces and cities. Liem said the province, before providing land to property companies to build social housing, ensured that all people affected by new housing projects received compensation payments. Around 200 enterprises in the province’s industrial parks have built a total of 270,000 sq .m of housing space for their workers. Liem said the province had issued regulations, as part of its industrial development plan, that require land be set aside for housing for workers. The province has also streamlined administrative procedures for investors in social housing. Nguyen Van Hung, CEO of Becamex IDC, said that regulations for social housing eligibility should be adjusted and that anyone who has job but who has never owned a house should be allowed to buy social housing. Vice chairman of HCM City People’s Committee, Le Van Khoa, said the regulated maximum profit for investors in social housing of only 10 per cent was too low to attract investors. Hung said that Becamex IDC was not yet earning profit from its social housing projects in the province, but expected to see profits over the long term. He said that companies willing to wait for profits over the long term should work with the government to offer accommodation for workers. Most social housing projects in Binh Duong Province are near urban areas and industrial parks, which attract a large number of workers. This, in turn, helps attract investors who want to open companies and factories in urban areas and industrial parks built by Becamex IDC, the representative said. The need for low-income housing in the country is emphasised in the government’s National Housing Development Strategy. Last year, an additional 0.5 million sq metres of social housing in urban areas were built, raising the total area to 3.3 million sq metres. Prime Minister Nguyen Xuan Phuc recently instructed several agencies and all local authorities to improve housing availability. He has asked provincial and city People’s Committees to provide land and simplify administrative procedures to encourage property companies and enterprises with a large number of workers to build social housing, especially for workers at industrial parks. He said that localities must ensure the quality of social housing, as well as traffic, health care, educational and cultural conditions, near the housing projects. Phuc has also asked the Ministry of Construction to conduct research on new materials to help reduce prices of social housing. Regulations require that localities in the country allocate 20 per cent of funds received from investors in new urban zones and commercial buildings (of less than 10 hectares) for social housing projects, Phuc said.